Preheat your oven to 325* degrees. In a medium bowl whisk the flour, baking soda and salt together. Set aside. Either by hand or with your mixture mix together the melted butter, salt and light brown sugar until thoroughly blended. Mix in the egg, egg yolk and vanilla until combined. Add the dry ingredients and beat on low speed (or mix by hand with a spatula) just until combined. Stir in the chocolate chips. Make about 1 in balls and place on your cookie sheets. Bake for 15-18 minutes and then allow to cool on cookie sheet. Yum! 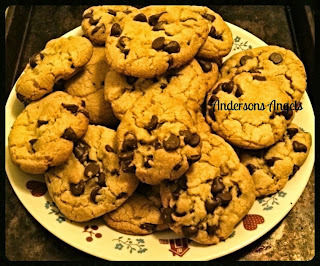 I love chocolate chip cookies and my kids love helping me make them (and eat them). Those look SO good! I know Kynlee would love helping me make these (and eat them, too)! I have been craving chocolate chip cookies. I found an awesome single serving (in a cup! ), but that doesn't work when the kids want some. We agreed to make chocolate chip cookie bars, so I'll have to try this recipe. :) Thanks for sharing (and for linking up)! Hey, you can never go wrong with chocolate chip cookies! Thanks for sharing... I'll need to try this. I love me some chocolate chip cookies for sure. These look really good. Ooh now I'm totally craving these! Those look amazing! I have not found a recipe yet that I love for Choc. Chip Cookies. Now off to try this one!